So with that in mind I thought I would share things I have been loving for YEARS. And they are so good they are still available. Major classics. The topic is athleisure (#duh), so this is kind of the basic mom's starter pack haha. But I truly use these things weekly (and my nikes and fitbit are daily). 1. Lululemon Define Jacket. This thing is so popular and for good reason. It's incredibly flattering, well made, washes perfectly and isn't too heavy or too thin. It's stretchy enough to wear over long sleeves or short sleeves, and also layers under a down vest perfectly in the winter. I have it in two colors (black and blue stripes), but seriously I want them all. Shop here. 2. Gap Sports Bra. I have the medium impact and it's perfect for running. I have a small/medium size chest, and I wear a medium. It's great quality-- I have two and they are about 3 years old. I was also able to wear them through almost my whole pregnancy (so pretty stretchy, but still provided support). They have a bunch of different styles and colors. Check them out here. 3. Nike Frees. Again- these are classics. I have 4 different colors and they just work for me. Super comfy for everyday wear or working out. 4. Gap Tanks with built-in shelf bra. I love a good tank with a shelf bra, but a lot of times they just don't fit perfectly. These really work for me. I wear a small in the tanks (as opposed to medium in the bras) and I can run, but can't do too much high impact jumping/burpees, etc. 5. Patagonia Fleece. I actually have the full zip (in this exact color). It's heavier than the define jacket, but not too heavy to wear inside. I got it when I was pregnant in a size up and was able to layer long sleeves underneath if needed. Super cozy, and I really like the length too. To me it's a more put-together sweatshirt, but still just as comfy. Check out a bunch of Patagonia fleece options here. 6. Fitbit. I got my first Fitbit in 2013 and have been using them off and on since then. I now have the Fitbit Alta and I love it. I credit this for helping me lose the last of my baby weight. It keeps me accountable and helps me want to get more activity in my day. 7. Zella High Waist Live in Leggings. OMG. These are amazing. I've had zella leggings for years and they are super comfy and hold up EXTREMELY well, but the high waist are a game changes. These are perfect if you are pregnant or postpartum as they really provide great support (and no love handle squishiness in the early postpartum days!) Not my fave for working out in, but for everyday wear these are the winner. 8. Swell Bottle. It doesn't get any chicer than this! I like using straw cups at home, but on the road, these are the perfect size to throw in my bag, and they are just beautiful! They will also keep your beverages cold for 24 hours. More cute patterns here! Old Navy Quarter Zip. These are a great length to wear with leggings, and super soft. And you can't beat the price! Old Navy Seamless Sports Bra. The seamless fabric makes these super comfy and if you want a breastfeeding-friendly sports bra, then these are great because they are so stretchy. Again-- the price is right! I ended up getting a couple different sizes when I was pregnant and postpartum when my old sports bras were getting too tight. Lululemon High Rise WonderUnder. I like these high waisted leggings for the same reason as above, but I love this material for working out. I have honestly never found a pair of leggings that fit me better and stay put during runs and workouts better than Lulu!! And I love the 7/8 length for my height. I'm 5'2 and these are perfect! Okayyy... so that's it. 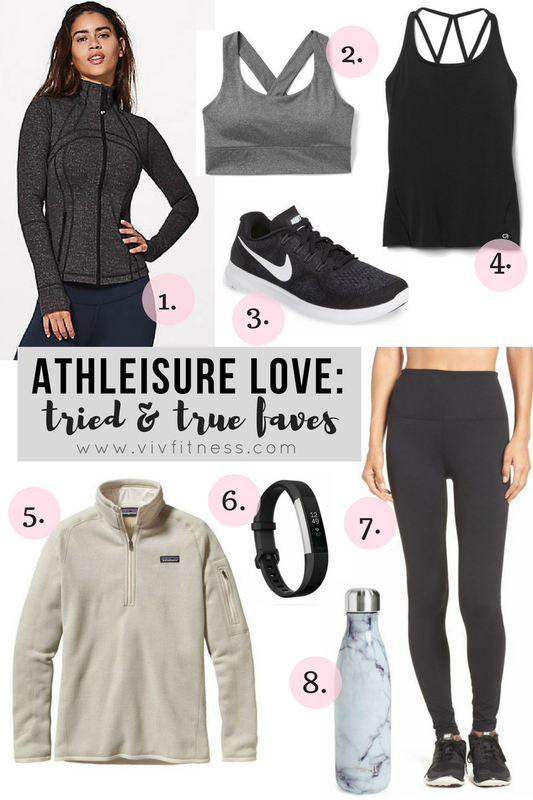 Who knew I had so many words about ATHLEISURE?! Jk, This is how I dress everyday, so I have big feelings. Please let me know your all time favorites!! Beauty, clothes, boots, jeans... whatevs. I'm nosey and I want to know what you swear by. You know you're supposed to be drinking plenty of water, especially in this summer heat-- but what if you hate drinking plain water?? Just like any other habit, it helps to ease yourself into it! Here are 5 tips to help you stay hydrated plus what to do if you hate drinking plain water. Flavor! I love adding fruit or citrus juice, herbs (like mint leaves), or even flavored stevia drops to my water. You don't actually have to drink water "plain" to get the benefits! Try using an infuser like the one linked below, or drink tea and then slowly dilute it. Take it with you. Having a water bottle with you wherever you go is super helpful if you are trying to stay hydrated. Bottles like the swell ones below are perfect because they are insulated and won't leak in your purse! Water first. If you like having a soda or cocktail when going out, drink a full glass of water before each beverage. This also works when eating at home! Having a glass of water before each meal has also been proven to assist in weight loss (#winwin). Fill your bottles everyday. Simply making sure you have 2 or 3 filled and chilled water bottles ready at the start of each day can help you to drink more! I suggest either making this part of your evening routine and filling your bottles and sticking them in the fridge, or first thing in the morning so they are ready to go! What about if you love bubbles?? If you love carbonation there are a million types of flavored sparkling waters. If you need to, add some stevia drops or a squeeze of lemon or grapefruit for a refreshing drink without the calories (or aspartame) of other bubbly beverages.